Light rail for Brisbane? Discussion .. It is interesting to note that light rail is really moving ahead globally and particularly around Australia. Even Newcastle is now seriously looking at light rail. Brisbane already has issues with inner city bus congestion and once the Gold Coast light rail commences I am sure that many will start to wonder why Brisbane has not moved into light rail. This article is interesting ..
TRAMS will return to Brisbane streets as part of the biggest overhaul of the city and its transport network yet. The city council and State Government have agreed light rail will be the key to managing Brisbane's predicted massive growth over the next 15 years. They have committed to the Smart City overhaul, which also will see five new river crossings, office developments in suburban areas and the revitalisation of urban areas. The combined approval means the plan can proceed without the political interference that dogged previous attempts to modernise the city and manage population growth. Premier Peter Beattie last night told The Courier-Mail the State Government was committed to both the scheme and its cost. Mr Beattie said a combination of State Government funds and private sector investment would be needed over the next 10 to 15 years. "If we don't do this now then the quality of life we enjoy will be diminished and we believe we can actually improve it," Mr Beattie said. "We're guiding this over 10 to 15 years so we have time to fund this, we have time to budget for this." The plan follows intensive infrastructure changes made over the past five years including traffic tunnels; plans for a duplication of the Gateway Bridge; new hospital precincts at Woolloongabba and Buranda; Kelvin Grove's urban village; the Portside residential and cruise ship development; the water pipeline from the Gold Coast to Toowoomba; and the Goodna bypass. A Federal Government plan to audit available Commonwealth land for residential release also could see a new housing development at Bulimba. Announcing the details of the new transport links yesterday, Mr Beattie said about three years of planning would be needed but one section of the plan – the Tank Street Bridge – already was under way. City Hall estimates the light-rail system will cost $250 million but Mr Beattie said the total figure would not be known until the route was chosen. The light-rail network – likely to be the biggest in Australia after Melbourne – will link South Brisbane to New Farm and possibly Bowen Hills. It could be extended because Brisbane's Southeast Busway, the under-construction Inner Northern Busway and the Eleanor Schonell Bridge, linking Dutton Park to St Lucia, can all take light rail. At the centre of the Smart City plan is the goal to link the University of Queensland with South Bank, the Queensland University of Technology's Gardens Point and Kelvin Grove campuses and the Royal Brisbane Hospital. Three pedestrian "spines" running through the city will join four new pedestrian and cycling bridges – in addition to the Tank Street bridge – linking West End, Woolloongabba, Kangaroo Point and Bulimba with the CBD. The pedestrian bridge attached to the Victoria Bridge will be privately funded in the North Bank development and the Tank Street bridge has already been funded with $63.3 million. The Government estimates the other three proposed bridges will cost $80 million each. Lord Mayor Campbell Newman said he welcomed the move, which backed the ideas put forward in Brisbane City Council's 2006 CBD masterplan. "There's no monopoly on good ideas and I'm just pleased (Mr Beattie's) talking about funding, as I understand it, light rail in Brisbane and also some new pedestrian and cycling bridges," Cr Newman said. "That's exactly what council wants to see happen." Cr Newman said City Hall was conducting a mass transit study and would take the results to the State Government in September for funding. His rival for City Hall, Labor's mayoral candidate Greg Rowell, fumbled his commentary on the plan. "Well it's welcome isn't it. It's a great contribution to Sydney, ah to Brisbane," he told Channel 7. State Opposition transport spokesman Tim Nicholls accused Mr Beattie of plagiarising council's masterplan to distract people from the water and health crises. "This work has all been done before," Mr Nicholls said. "The Premier just needs to get on and fund the plan." Brisbane tram services ended on April 13,1969. Re: Light rail for Brisbane? Discussion .. I'm still adamant that the blue CityGlider should have been light rail from the outset, as originally planned. The line would need to traverse a new green bridge at Adelaide Street. Unless Victoria Bridge became a green bridge and Cultural Centre widened significantly to accomodate an island LR platform (crazy) that is. It'd mean closure of Adelaide Street (From Edward St to North Qy) to all but buses, taxis and authorised delivery vehicles only. 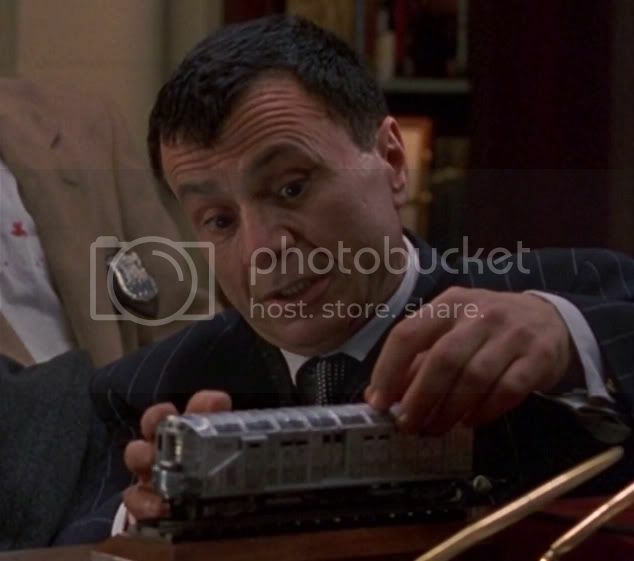 Transport Research Board --> Light Rail Down Under: Three Strikes and You're Not Out ! Brisbane does not have light rail because Brisbane City Council got in the way. Again. The sooner public transport is privatised off their hands, the better. It might give a more mode neutral outlook on things. I think the busway replacement with metro and CRR are priorities as well as bus stop rationalisation both within the CBD and outer suburbs plus a bus review to introduce more rapid style and SmartBus style services. This is possible. All previous proposals had LRT run over the Victoria Bridge in their plans. The busway would have to dive under the Brisbane River IMHO as running LRT through CC is a non starter so long as it is overcapacity. Melbourne has done this with Swanston Street already, Brisbane has done it with Queen Street Mall (Buses underneath). The issue would be answering the question "What is the purpose of the LRT network" and "Where should it go". Is it purely for capacity reasons (i.e. because buses can't cope with the load - route 199) or rapid transit (might have to go over or underground - $$$). meant it was effectively buried from the beginning. I was at a major hospital the other day LD. Just chatting with some staff, one person said why is public transport so bad in Brisbane? They have lived in Sydney and Melbourne and said that Brisbane lags a long way behind. The person complained bitterly about the poor frequency of rail services, particularly in the evening and cost of fares. As a lot of hospital people do various shifts, they really do feel the impact of our mediocre network overall. The Greens have an ambit light rail proposal on the books somewhere. It is good in spirit but I think it needs a lot of refinement. But therein lies the solution also. The current paradigm has worked but is built up on the assumption that fares and subsidies and rates can rise to infinity without anyone noticing. It is an unsustainable paradigm. How can it survive? There are two ways- continue the status quo - the other divisions of BCC are cannibalised, rates go up, savage cuts to the network are made or, by some miracle, BCC wakes up and introduces connections into the network voluntarily. The third way, which I think is the path of least resistance, is to privatise it. I'm sad to say I've lost interest in Brisbane's bus system. The critical thing for me is that the State will no longer fund the largesse and antics associated with it. That means money is not being stolen from other bus network regions that need it much more than the BCC area. The Sunshine Coast and Gold Coast will get improvements in service in the near future, and the outer metropolitan regions (GC and SC included) will probably all go through competitive tendering and will therefore be exposed to even more efficient working/timetabling practices and possibly the installation of other operators who can bring both expertise and buses in from elsewhere. Democracy would suggest that Brisbane wants its current bus network largely unamended - and so, in order to be completely fair, ratepayers can pick up the tab instead of the rest of the state. Sounds decent enough to me. I will continue to maintain an interest in developments but as long as money doesn't keep getting sucked out of the TransLink budget at such high rates and I still have access to the inner city routes I use most, I'm fine personally. My efforts will be devoted to the Gold Coast network and the rail system at large for the near future. I think that despite the mess, the rail system is going to start working a bit better. The limited detail I have been given about the sector II rewrite, which is now supposed to be due some time within the next 12 months, points to something fairly decent. I don't believe LRT is going to happen in Brisbane for a very long time, if at all. BCC would have to stop running buses altogether for it to get a look in, and the current councillors would all need to have vanished. Further to the point, they would want to look at how decently the Gold Coast system operates for a few years before considering it seriously. I also think that partisan politics in the BCC will make it difficult to get bipartisan support for anything, let alone something as contentious and expensive as this. There is a growing groundswell for light rail. I have noticed reasonable amount of comment on light rail suggestions/letters/blogs etc. They will have to move eventually. So I think it is worthwhile to consider the options. BusLink is not going to do a great deal in all reality for inner city. BusLink will help to get many of the buses off the surface though which then allows for a surface light rail network on the key inner city routes, which is where I think light rail will be useful. The effect of BusLink (in my opinion) is to further entrench the monopolist that is BT and lock the city into buses and the direct service network paradigm while uploading the entire cost of this to the State Government (at least $1BN cost I would guess). It is essential that any action by TMR is based on its own independent report, not the BCC's. There has been zero public consultation on BCC's plans. I think a rail in the core of the CBD should be looked at. An actual metro in the CBD section based on something automatic like Skytrain. There is precedent for this - Ottawa, Canada which is replacing the core section of the transitway with metro-like LRT. It also provides a precedent for busway conversion. There has been a lot of advances in LRT in recent years which will reduce cost, increase options (i.e. no overhead wires) and a larger market in LRT worldwide means more competition; key choices will be surface, elevated or subsurface options and whether it needs to go into the CBD core or just feed something like a metro (i.e. Toronto's Cross-Town LRT feeds the subway). Al Sufouh Tramway is a tramway being built in Al Sufouh, Dubai. It will run 14.5 kilometres (9.0 mi) along Al Sufouh Road from Dubai Marina to the Burj Al Arab and the Mall of the Emirates. It is expected to interchange with three stations of Dubai Metro's Red Line.The trains will consist of First Class (Golden Suite), and a carriage dedicated to women and children in addition to a silver carriage. The Sufouh Tram will also links up with the monorail of the Palm Jumeirah at the entrance of the Palm from Sufouh Road to facilitate passengers in the Palm. Dubai's long awaited Al Sufouh tram will meet its deadline of November 2014, according to the main contractor. Dubai is in process of building the worlds first 100% modern wireless tram/LR. I suspect once they are up and running at end of next year (trams currently under test in Europe) and the system proves itself, we will not see another Greenfield LR system with O/H again. Its just a pity the GC project bailed at the last minute and went O/H. Overall I think the biggest obsticle to LR is the actual construction where for 12-18mths you have the worst of everything. Road has restricted access, buses cannot flow freely, no LR and shop keepers suffer massive distruption. The Dubai LR construction has been an absolute nightmare in the growing Marina district. Main issue was works in the most congested area were suspended early in construction for nearly 2 years, however that area is nearing the end. Probably part of teh benefit for some LR projects is that doing a true before and after comparison is impossible as no one remembers pre construction anymore. It's interesting that you mention this one, because from what I have seen and heard there is now virtually no interest in ground-level power supply in Europe or anywhere else. There are some trams somewhere in SE Asia which will run on CNG combustion, but overwhelmingly OHW is still on top. Agree absolutely about the construction phase. It should all be a distant memory by next year in both cases. 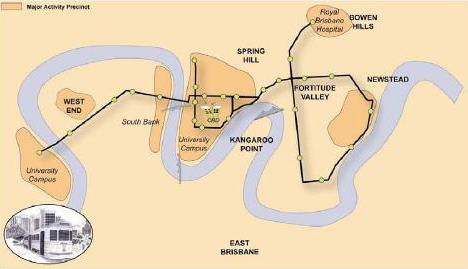 Premier Rob Borbidge today released details of the preferred route for Brisbane's 21st Century Briztram light rail network. The preferred network will link Fortitude Valley, Newstead, West End, the City centre, South Bank, the Royal Brisbane Hospital, Roma Street and the University of Queensland. The network will be about 14km long and cost around $230m. "The selection of the preferred network is the culmination of extensive work and consultation," the Premier said. "The Government has clearly listened to the community and we have ruled out some route options which were causing concern. "These include the use of the Brunswick Street mall, crossing the Queen Street mall and the Dutton Park route. "Now that we have one network to examine in more detail, we can look more closely at local issues and maximising benefits to residents and businesses." Network alternatives were released on 25 February and since then considerable community interest has been shown and feedback has been received on all options. "We have been delighted with both the level of support and interest in the project," the Premier said. "One of the key factors in choosing the preferred network was integration with other public transport modes." "The network will allow scope for extensions and when we receive proposals from the private sector these may well receive further consideration. "One of the attractive features of the network is the possible extensions by the option of joint use of busways by trams and buses." The Premier said that the Government is well on track to meet the commitment to call expressions of interest on 1 May. This will ensure that the system will be operational by the end of 2001. The Prime Minister's $65m commitment has given the project a real boost. "In this lead-up to the expressions of interest process, we have concentrated on getting the detailed studies in place. The planning, demand forecasting and financial analysis all show that this project is a winner." Apart from the 3000 jobs the project will create, the improved accessibility in the city will benefit shoppers, workers, tourists and residents. The demand forecasting work confirms that over 45,000 people will benefit every day from the system. "I have said all along that Briztram is a land use/transport vision for Brisbane which will provide the city with a world-class integrated transport system and encourage urban renewal and redevelopment in the inner city." "The private sector are chomping at the bit to put in to develop the system and in a week's time they will have their chance when we call for expressions of interest." "Obviously the support of the Brisbane City Council is important as they will be a major beneficiary of this proposal, the Premier said. "Despite the overwhelming support for the project so far from the community, business and industry, the Lord Mayor continues to criticise this visionary public transport solution to the Brisbane's increasing transport problems. I am hopeful that he will begin to see the light and recall his earlier commitment to light rail following his overseas trip." The corner of Melbourne and Manning Streets, South Brisbane (between 8.30am and 5.00pm). The Queensland Transport Customer Service Centre, Anzac Square, 202 Adelaide Street, the City (between 8.30am and 4.30pm). Further information can also be obtained by calling 1800 809 972 or assessing the Briztram Internet site on www.briztram.qld.gov.au. projects of regional or historical significance. the Federal Government and received a $65-million start-up grant. Plan achieve its aggressive mode-share targets set some 5 years previously. BRIZTRAM was promoted as both a sustainable transport solution and a historical tramway. Cultural Centre precinct in the South Bank area also presented difficulties. unseated in an election in 1998, the project was shelved. Oh dear, the West End has turned into a bus precinct. Pity, what might have been ..